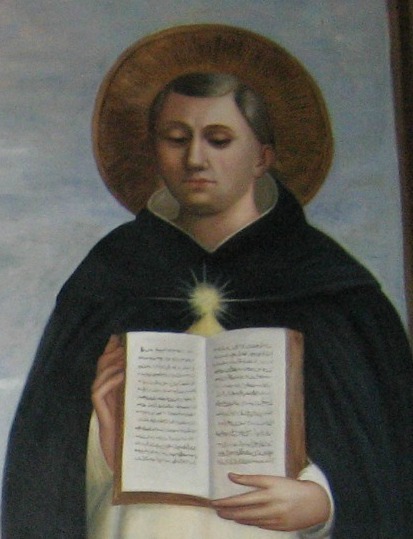 St. Thomas Aquinas, priest and doctor of the Church, is patron of all universities and of students. His feast day is January 28th. He was born toward the end of the year 1226. He was the son of Landulph, Count of Aquino, who, when St. Thomas was five years old, placed him under the care of the Benedictines of Monte Casino. His teachers were surprised at the progress he made, for he surpassed all his fellow pupils in learning as well as in the practice of virtue. When he became of age to choose his state of life, St. Thomas renounced the things of this world and resolved to enter the Order of St. Dominic in spite of the opposition of his family. In 1243, at the age of seventeen, he joined the Dominicans of Naples. Some members of his family resorted to all manner of means over a two year period to break his constancy. They even went so far as to send an impure woman to tempt him. But all their efforts were in vain and St. Thomas persevered in his vocation. As a reward for his fidelity, God conferred upon him the gift of perfect chastity, which has merited for him the title of the "Angelic Doctor". After making his profession at Naples, he studied at Cologne under the celebrated St. Albert the Great. Here he was nicknamed the "dumb ox" because of his silent ways and huge size, but he was really a brilliant student. At the age of twenty-two, he was appointed to teach in the same city. At the same time, he also began to publish his first works. After four years he was sent to Paris. The saint was then a priest. At the age of thirty-one, he received his doctorate. At Paris he was honored with the friendship of the King, St. Louis, with whom he frequently dined. In 1261, Urban IV called him to Rome where he was appointed to teach, but he positively declined to accept any ecclesiastical dignity. St. Thomas not only wrote (his writings filled twenty hefty tomes characterized by brilliance of thought and lucidity of language), but he preached often and with greatest fruit. Clement IV offered him the archbishopric of Naples which he also refused. He left the great monument of his learning, the "Summa Theologica", unfinished, for on his way to the second Council of Lyons, ordered there by Gregory X, he fell sick and died at the Cistercian monastery of Fossa Nuova in 1274.